New Plymouth-based duo, Frank John & Erin Manu, is Taranaki's foremost guitar duo. Originally from Amsterdam, guitarist Frank brings his technical brilliance to this duo. Born & raised in Taranaki, Erin provides the contrast with her Pacific rhythms and smooth and smoky vocals. The couple has gained a reputation for breathing life into their interpretations of covers - "high-energy bluegrass, lonesome blues, heartfelt ballads and country-swing" - with tight harmonies and solid arrangements of well-known standards, hidden gems and their own compositions. Whether it's a sizzling instrumental or the soulful delivery of a ballad, this partnership creates a unique sound, influenced by American Roots Music. The addition of bass maestro, Rob Greenfield (classical/jazz), provides another layer and, at last, space for light to shine on Frank’s well crafted instrumentals. 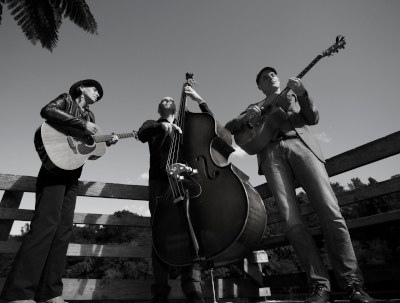 West Auckland Acoustic Music Festival, hosted by Titirangi Folk Music Club, returns to Motu Moana Scout Camp in Green Bay for its second year. Come along and welcome in the summer with a fabulous weekend of song and music. We have a great line-up of guests who will provide a varied and entertaining programme . The week-end will feature a number of concerts, a spoken word session, 2 blackboard concerts, a song-writer’s forum, and a Native Birds of NZ workshop presented by Martin Curtis. Sunday evening will be given over to the popular Kitchen Session—an informal social gathering and singaround in the dining hall. The weekend is fully self catering but there are shops and cafes nearby if required. You can register by emailing your details (name, number of weekend, day or evening tickets required) to our secretary. A confirmation email will be sent to you containing the amount due and payment details. Numbers are strictly limited so it would pay to register early to secure your spot..
Motu Moana Scout Camp, 90 Connaught St, Blockhouse Bay. Motu Moana has advised us that they do not allow caravans on site. Campervans and motor homes are fine but, unfortunately, no caravans. Also there are no powered sites available.